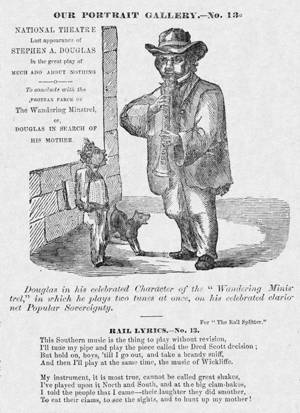 In this Chicago Rail Splitter cartoon Stephen A. Douglas is a minstrel in blackface who “plays two tunes at once.” The image and text criticize the presidential nominee of the largely Northern faction of the Democratic Party for taking both sides on the question of slavery expansion in order to win votes in the North and South. He was identified with “popular sovereignty,” the idea of allowing territorial voters to decide the issue without interference from the federal government. Nevertheless, he accepted the party platform plank, written by Governor Robert Wickliffe of Louisiana, which avowed that the United States Supreme Court was the final judge concerning the territories. The “sovereignty plank” implied the legitimacy of the Supreme Court’s Dred Scott decision (1857) forbidding a ban on slavery in the territories, even though the ruling had been bitterly opposed by Douglas for violating popular sovereignty. The last line of the lyrics refers to his campaign speaking tour undertaken on the pretext of visiting his mother.